I found this simple slow cooker recipe on Facebook and thought I’d pass it along to my readers. 1. 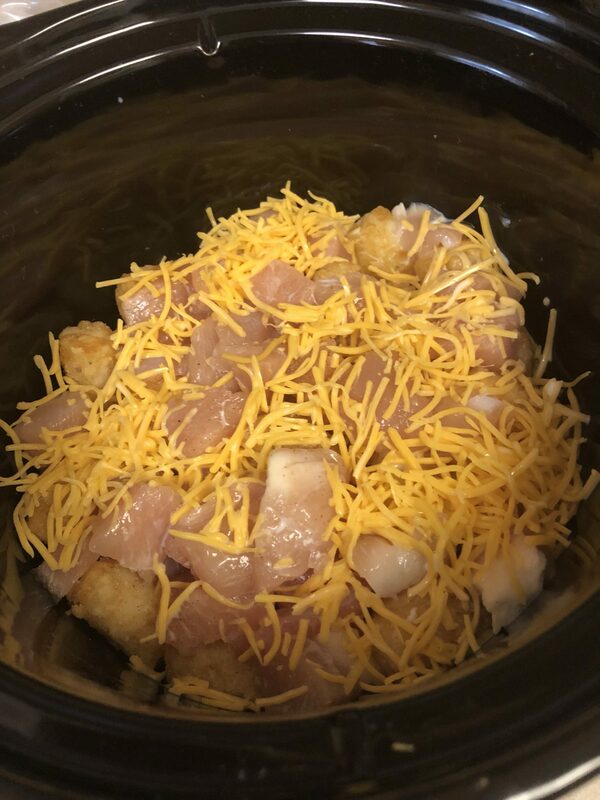 Layer half of the frozen tater tots on the bottom of the slow cooker. 2. Sprinkle with 1/3 of the bacon pieces. 3. Now top with 1/3 of the shredded cheese. 4. Add diced chicken on top. Season with salt & pepper. 5. Now add 1/3 of the bacon pieces and another 1/3 of shredded cheese. 6. Put the rest of the frozen tater tots on top. 7. Finish with the remaining 1/3 cheddar cheese and remaining 1/3 of bacon pieces. 8. Pour 3/4 cup milk over the top. 9. Cover and cook on low for about 4-6 hours. I made a couple of alterations to this recipe. First, I did not use the entire bag of tater tots. I used maybe 3/4 of the bag. I also left out the bacon. I don’t eat bacon very often because I get disgusted thinking about how bad it is, but I’m sure the recipe tastes better with it. You can also cook this on high for around three hours. 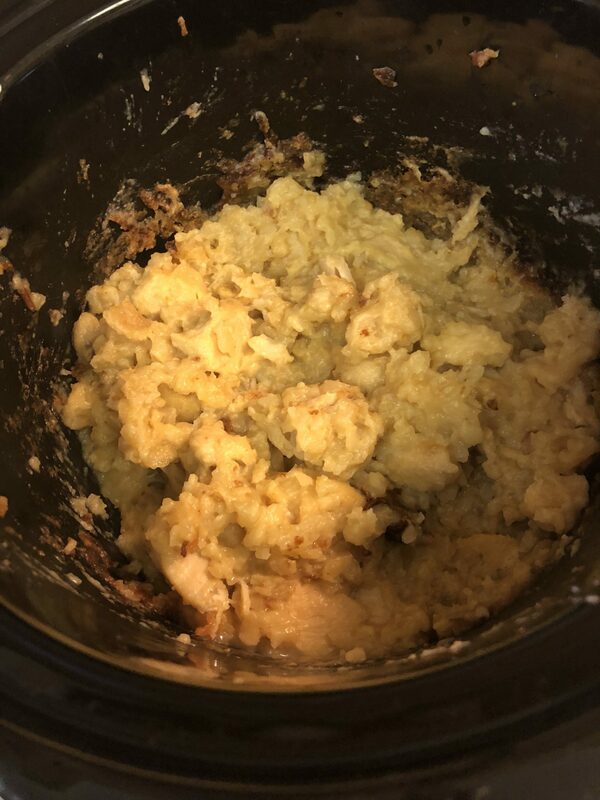 The first time I made this, the texture was more like shredded hash browns, but this time the texture was more like mashed potatoes. It’s not the healthiest option, but it tastes good and it’s simple to make. 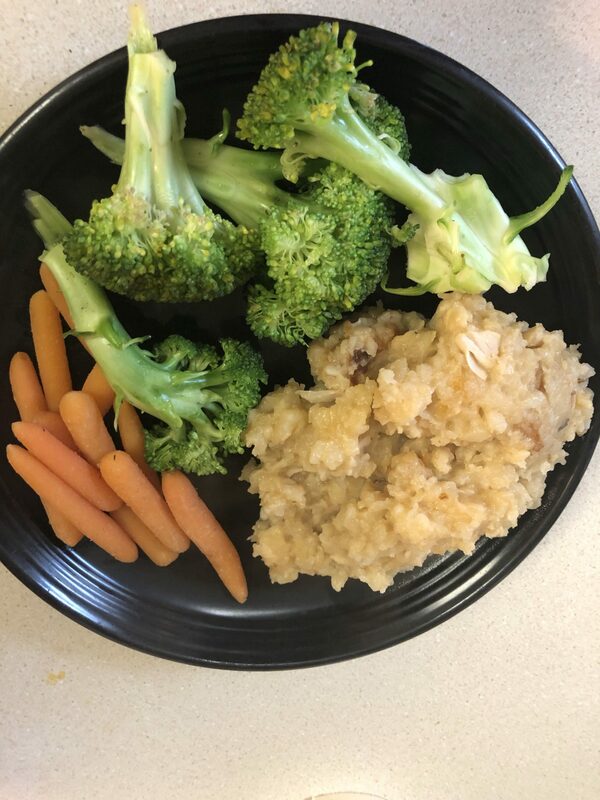 I served it with broccoli and carrots. Looks great – will try it out! I’m assuming the bacon is raw when put into the crock pot? No. I think it’s bag of pre-cooked bacon. I’m assuming that if you use raw bacon, it would cook in the crock pot. I haven’t tried it with the bacon, but I left it on the ingredients list because it was in the original recipe.